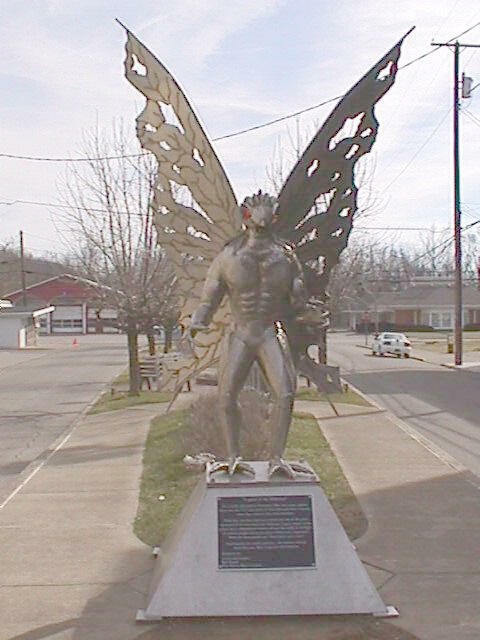 Mothman refers to a night-flying monster that resembled a giant moth and frightened some people near Point Pleasant, West Virginia, in 1966-1967. The lore around the story magnified in 1975 when John Keel published The Mothman Prophecies. The story was legendary by the time the movie came out in 2002, starring Richard Gere; it's now available on DVD. At this point it seems relevant to consider a real West Virginia winged creature—one that has "nocturnal habits" and "large, staring eyes" of the type that yield crimson eyeshine, plus "facial discs" that can make the eyes appear even larger. It has a large head and (unbirdlike) is "monkey-faced," but looks "quite neckless" (its very short neck sloping into its body so it could seem headless in silhouette). It has "oversized wings and long legs," the latter being "powerful" and (unlike the spindly legs of many birds) covered with feathers, making them look relatively thick. Its flight is "noiseless" and indeed "mothlike," although during flight it may vocalize a "loud, trailing 'khree-i.'" Its broad range includes West Virginia, and it is a "widespread nester in human habitations"; in fact it "hides in old buildings" ... as well as barns. Because it is active only at night, it is "seldom disturbed or even seen by humans," so when it is encountered it has an unfamiliar as well as "sinister appearance" Its name is Tyto alba, the common barn owl. (Nickell 2002). The folks in Point Pleasant have made the best of the situation and now celebrate their mythical monster with an annual festival and a small Mothman Museum where souvenirs may be purchased. A statue of the "monster" adorns a city street to commemorate the visitation. See also Men in Black. Joe Nickell. (2002). Mothman Solved.